"I was born on the 3rd of Dhu Q'ad 1294 A.H. (1876 A.D.)," Iqbal wrote in the 'Lebenslauf' of his Ph.D Thesis (Below). Iqbal usually quoted 1876 as the year of his birth approximately but the Islamic date actually corresponded to November 9, 1877 A.D. as pointed out in Rozgar-i-Faqir (Vol. 2) in 1963 and later ratified by two special committees appointed for this purpose by the Bazm-i-Iqbal in late 1972 and the Federal Ministry of Education in 1974. The findings seem to be genuine but they are sometimes subjected to unfounded suspicion since they matched the expedient needs of the Government of Pakistan – India had already celebrated the Iqbal Centenary in 1973! The mistaken date of birth, February 22, 1873, was first mentioned in the Lahore-based Urdu daily Inquilab on May 7, 1938 (sixteen days after Iqbal's death) and it later gained currency through Iqbal's first standard biography written by the editor of the same newspaper in 1955. The entry in the Municipal Register of Sialkot, on which this date was based is now seen as unrelated to Iqbal. Other dates regarded as Iqbal's nativity at some point include December 29, 1873 (propounded in 1971 by a family member who later relegated), 1875 (mentioned on Iqbal's Middle School Certificate) and December 1876 (miscalculated by Iqbal and his brother from the Islamic date actually corresponding to November 9, 1877). 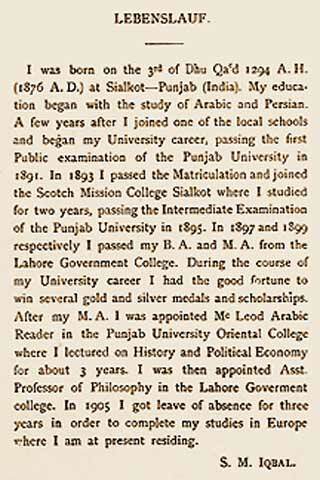 September 2, Iqbal leaves Lahore for studies abroad; visiting Delhi on the way, he boards a steamer from Bombay and arrives at Dover on 24th; enrolls with the Trinity College (Cambridge) on October 1 as advanced student of Bachelors and obtains a Matriculation Certificate from the University on October 21; enrolls with Lincoln's Inn (London) on November 2 for Bar at Law.